Another week, another Southern snowpocalypse. Anyone else sick of this winter yet? This time it's poor North Carolina's turn to get obliterated by snow... and they're not reacting well. 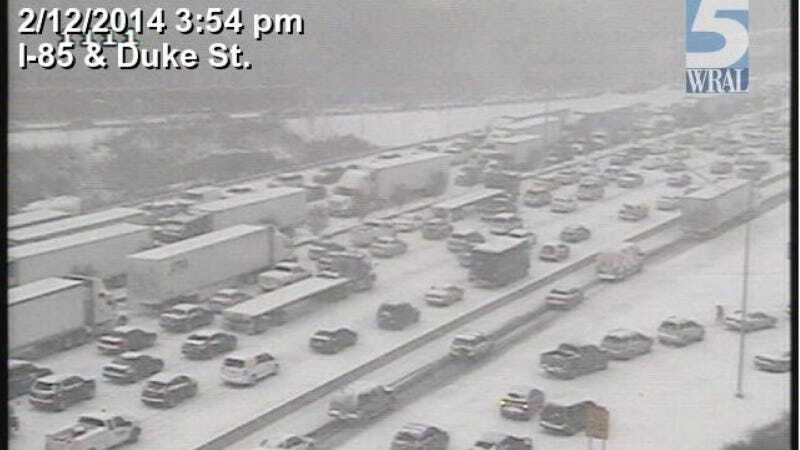 Raleigh TV station WRAL reports that parts of North Carolina have been getting anywhere from one to eight inches of snow since the early afternoon, and that has meant massive traffic snarls. A number of highways, including Interstate 85 in Durham and Highway 50 in Creedmoor, are shut down in both directions. Others are exiting Interstate 40 to take shelter in malls. Dozens of accidents have been reported as cars slide into other cars. And in Raleigh, at least some people along Atlantic Avenue and other streets are just plain 'ol abandoning their cars on the side of the road. The cops are asking people not to do that, but with a windchill of 12 degrees, staying in the car if you're stuck is hardly a desirable alternative. Part of the problem is that everyone is hitting the road at the same time. Horrible, just horrible. Good luck to anyone who might be stuck in that.